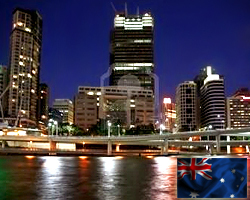 Business confidence in Australia ebbed in January, the latest survey from National Australia Bank revealed on Tuesday with an index score of +9. That's still positive, which means that optimists outnumber pessimists - although it's down from the downwardly revised +11 in January (originally +12). Business conditionals picked up steam as the index climbed to +21 from the downwardly revised +18 in the previous month (originally +19). 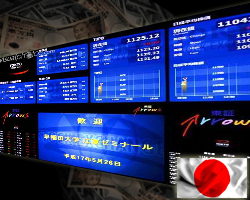 Producer prices in Japan were up 0.6 percent on year in February, the Bank of Japan said on Tuesday. That was shy of expectations for 0.78 percent, which would have been unchanged from the January reading. On a monthly basis, prices added 0.2 percent after sliding 0.6 percent in January. Individually, prices were higher for leasing and rental. They were down for advertising, transportation and architectural services. Household spending weakened to its lowest annual growth for six years in 2017 amid Brexit-spurred inflation, with borrowing soaring and family savings plunging to a record low. According to the Office for National Statistics, economic growth slowed to 0.4 percent in the final three months of last year, down from 0.5 percent in the third quarter as weaker household spending took its toll. The ONS revised upgrowth for the year as a whole to 1.8 percent from the initial estimate of 1.7 percent, but this was still the lowest since 2012. It leaves the UK with the lowest growth among the G7 economies at the end of 2017 as it enters the final year of its membership of the European Union. 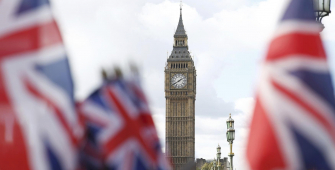 The quarterly national accounts data showed Britons turned to debt to support spending in the face of last year's surging inflation, which outstripped meager wage growth. The proportion of total income saved by households dropped to 4.9 percent in 2017, its lowest level since records began in 1963, the ONS said. Overall household spending dropped the previous year to 1.7 percent, which was the lowest annual growth since 2011, according to the ONS. In the fourth quarter, the current account deficit shrank to £18.4 billion, or 3.6 percent of GDP, down from £19.2 billion in the previous three months. Net trade – exports less imports – made its largest contribution to full-year growth since 2011, the ONS reported. Economists said there would be some relief on the way this year for households as wages are expected to start rising faster than inflation, which should help maintain growth in 2018. 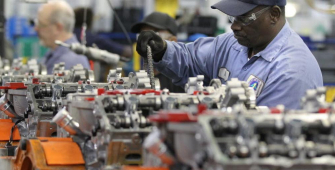 U.S. factory activity slowed in March amid shortages of skilled workers and rising capacity constraints, but growth in the manufacturing sector remains buoyed by strong domestic and global economies. According to the survey of the Institute for Supply and Management, a surge in the cost of raw materials and worries among manufacturers about the impact of steel and aluminum import tariffs imposed by President Donald Trump last month to shield domestic industries from what he has described as unfair competition from other countries. The ISM said its index of national factory activity slipped to a reading of 59.3 last month from 60.8 in February. A reading above 50 in the ISM index indicates growth in manufacturing, which accounts for about 12 percent of the U.S. economy. The survey's prices index soared to its highest level since April 2011. There were price increases across 17 of 18 industry sectors last month. While a measure of new orders dropped, a gauge of backlog orders rose to levels last seen in May 2004. The survey's customers' inventories index was at its lowest level since July 2011. A measure of factory employment dropped last month and the ISM said there were indications that labor and skill shortages were affecting production. U.S. financial markets were little moved by the data, with investors worrying about a global trade war after China increased tariffs by up to 25 percent on 128 American products in response to the duties on aluminum and steel imports. 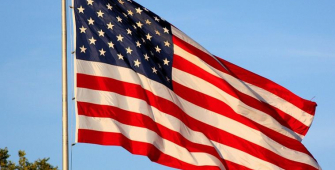 Nonetheless, the outlook for manufacturing remains upbeat amid dollar weakness, which is boosting the competitiveness of American-made goods on the international market. Federal Reserve Governor Brainard said that even with this year's correction, equities and other assets are still high in valuation by historical standards. In a speech shortly after the stock market closed and pared some of the deep losses incurred from Monday, Brainard became the latest U.S. central bank official to voice caution regarding the level of the nine-year-old-bull run in the stock market. Brainard said that the valuations in a broad set of market appears elevated in relation to historical norms, even after pricing in recent movements. Price tags on multi-family homes and commercial real estate properties have also increased, while capitalization rates, have hit historical lows, she added. Aside from stocks and real estate, the Fed official also issued a warning regarding cryptocurrencies such as bitcoin, which have observed big price declines this year after its astronomical surge in 2017. She also said there are few signs that cryptocurrencies would pose a widespread threat to the financial system. She also noted that corporate bond yields are low, while spreads on high-yield bonds over Treasuries are close to the low-end of their historical range. 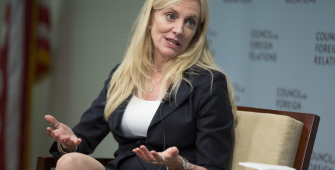 Along with her warnings regarding possible over valuations in financial markets, Brainard said Fed policy has helped curb the type of excessive risk-taking that resulted in the financial crisis of 2008. The Federal Reserve has been gradually tightening policy, raising the benchmark lending rate six time since December 2015, as it looks to prevent the economy from overheating. U.S. private payrolls grew sharply in March as hiring increased across the board, which indicates a strong labor market that continues to support economic expansion. Labor market momentum was also highlighted by a recent report that showed solid gains in employment in the services industries in March even though a sharp decline in new orders weighed on growth in the sector. The Labor Department will publish its closely watched employment report on Friday. The ADP National Employment Report showed private payrolls increased by 241,000 jobs in March after rising 246,000 in February. The ADP report is jointly developed with Moody's Analytics. It said construction companies hired 31,000 workers in March and manufacturers added 29,000 jobs to their payrolls. Employment in the services sector increased by 176,000 jobs. That was corroborated by the Institute for Supply Management's (ISM) non-manufacturing survey, which showed the ISM's employment sub-index rising to a reading of 56.6 in March from 55.0 in February. The increase in services industry employment came despite the ISM non-manufacturing index falling 0.7 point to a reading of 58.8 as a measure of new orders declined 5.3 points. A reading above 50 indicates expansion in the sector, which accounts for more than two-thirds of U.S. economic activity. Heavy snow and weak consumer demand weighed on British services businesses in March, which grew at the slowest rate since just after the vote to leave the European Union in June 2016, a survey showed. However, the 'Beast from the East' may not be enough to stop the Bank of England from pushing another interest-rate increase. The IHS Markit/CIPS services Purchasing Managers' Index (PMI) dropped to 51.7 in March from February's reading of 54.5, its lowest reading since July 2016. Britain's construction PMI showed a similar decline on Wednesday, although manufacturing held up better. Looking at the first three months of 2018 as a whole, the figures suggest Britain's economy expanded at a quarterly rate of just below 0.3 percent, down from an already-modest 0.4 percent at the end of 2017, IHS Markit said. Reports this week showed snow and storms weighed on growth in services to its weakest in almost two years, and saw the construction industry contract for the first time in six months. While the pound fell after the services report, investors are still pricing in an around 85 percent likelihood of the BOE hiking rates in May. The BOE has already factored in the hit from the bad weather, and downgraded its own estimate for the quarter. According to Markit, that means the Monetary Policy Committee's widely expected rate hike in May is still on the cards. Not all the weakness in the PMI was weather-related, though. 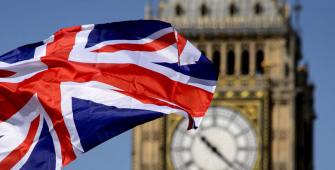 IHS Markit said British services businesses reported weak consumer demand as well as concern about the country's departure from the EU in a year's time as being behind the slowest growth in new orders since July 2016. Wall Street's major indexes advanced on Monday as a softer stance by U.S. policymakers on China tariffs powered a rebound from last week's selloff, but stocks pared gains late in the session after a report that the Federal Bureau of Investigation raided the office of President Donald Trump's lawyer. The Dow Jones industrial average rose 46.34 points to 23,979.10, with Merck and Intel as the best-performing stocks in the index. The S&P 500 climbed 0.3 percent to 2,613.16, with tech adding 0.8 percent. 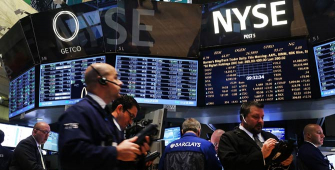 The Nasdaq composite advanced 0.5 percent to 6,950.34. At its session high, the Dow rose as much as 440.42 points. The S&P 500 and Nasdaq gained as much as 1.9 percent and 2.3 percent, respectively. Stocks climbed after Trump's new economic adviser Larry Kudlow told CNBC that the president may be open to forming an international coalition to grapple with trade issues involving China. Investors will look for further signs of China's stance on trade relations when Chinese President Xi Jinping speaks at the Boao Forum economic conference on Tuesday. Merck gained over six percent after a committee determined Keytruda has helped previously untreated lung cancer patients live longer. Shares of U.S. carmakers surged after Chinese President Xi Jinping announced the government's plans to “open the country's economy and to reduce the tariffs on automobiles. Tesla edged up 5.2 percent while Fiat Chrysler advanced 2 percent. Ford Motor increased 1.8 percent and General Motors increased 3.3 percent. China is an important market for U.S. carmakers. 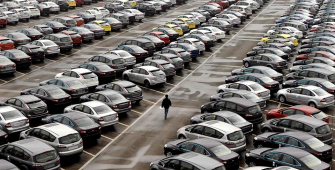 European automakers also rose, with BMW rising 3 percent. GM sold over 4 million cars in China in the previous year for the first time, while Tesla increased its revenue by twofold from China to $2 billion in 2017. Xi said that his plans include greatly lowering import tariffs on foreign autos and reducing duties of other products. At the Boao Forum for Asia, Xi said that China is planning to boost imports and reach a greater of balance of international payments under the present account. The Chinese leader's comments come amid escalating trade tensions between Washington and Beijing. In a retaliatory move against America's tariff plans, China has unveiled its plan to impose fresh duties last week on 106 U.S. products, which then resulted in President Donald Trump threatening more duties. This weekend, the U.S. softened its tone against China. On Sunday, Secretary Steven Mnuchin told CBS that a full-out trade war between the U.S. and China is not seen to take place. On the same day, Trump said that he will always have friendly ties with President Xi no matter the consequence of their trade conflict. He also said that China will roll down its Trade Barriers because it is the proper action to take. The U.S. government ran a $209 billion budget deficit in March as outlays grew and receipts fell, the Treasury Department said. That compared with a budget deficit of $176 billion in the same month last year, according to Treasury's monthly budget statement. When accounting for calendar adjustments, the deficit was $165 billion in March compared with an adjusted deficit of $134 billion in the same month the previous year. The deficit for the fiscal year, which started in October, was $600 billion, compared to a deficit of $527 billion in the same period of fiscal 2017. Unadjusted receipts last month totaled $211 billion, down three percent from March 2017, while unadjusted outlays increased to $420 billion, which is seven percent higher from the same month the previous year. The Congressional Budget Office had expected a $207 billion deficit for March. The nonpartisan agency said this March had one less business day than March 2017, and a smaller share of wage income is being withheld this year for taxes. The CBO recently forecast that the federal deficit will reach $804 billion in fiscal 2018, up from $665 billion in fiscal 2017. 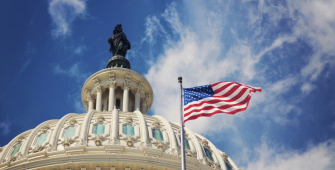 It increased its estimate for this year's deficit mostly due to recent legislation that cut taxes and increased spending on the military and domestic programs. It had already expected widening deficits in the coming years as outlays, including spending on programs like Social Security and Medicare, rise faster than revenue.